I enjoy kayaking the beautiful spring fed rivers of north Florida. Many of the waterways have a canopy of draping tree limbs which shade paddlers as we glide along. Birds abound in this magical environment, White and Great Blue Egrets fly by, komorants dry their outstretched wings and king fishers dive in front of boats. The magic of Disney cannot touch the natural wonders found in Florida's crystal clear springs and rivers. 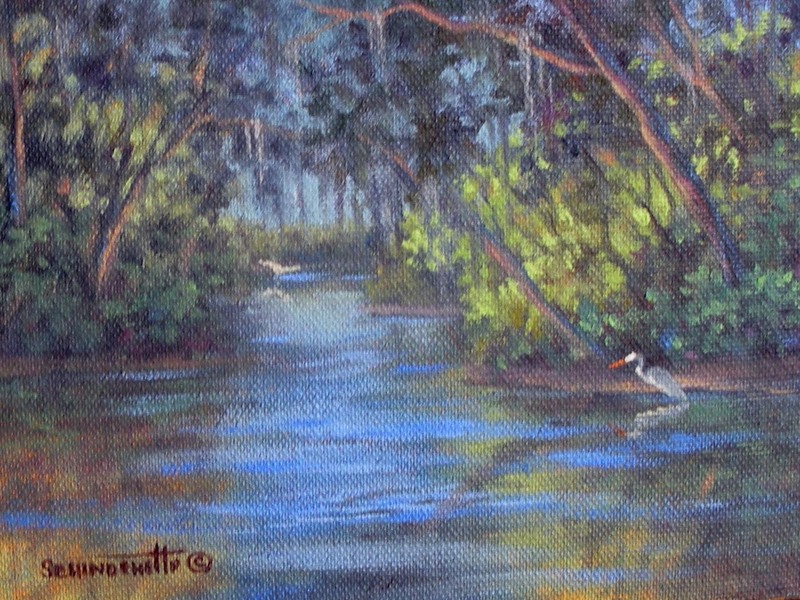 This painting was inspired by a kayak trip up the Silver River. In the heat of the summer there is nothing better than paddling under the thick canopy over the river with the cool air rising from the water. 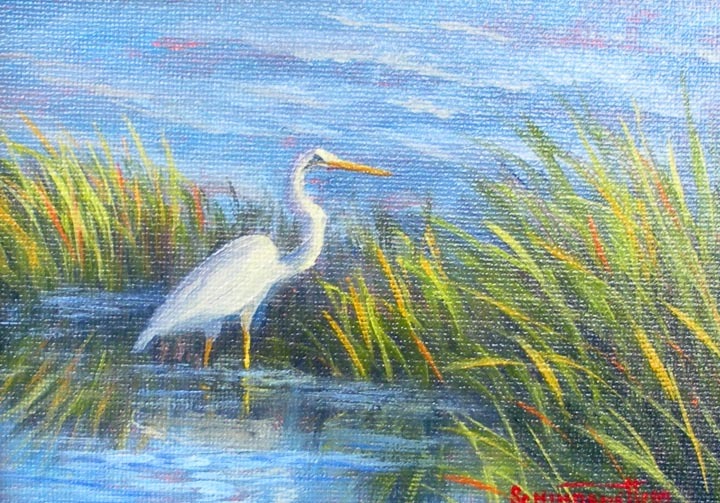 "White Egret Fishing" is 5"x7" painted in oil on canvas mounted on board. Casmerodius albus or Great White Egret is common along streams, ponds, rice fields, salt- and fresh-water marshes, and mudflats. The plumage is white, bill yellow, legs and feet glossy black. Larger than any other heron except the Great Blue. In flight, the Great Egret holds it neck in a more open S than do other white herons. Colleague and friend Peggy Watts and I attended the opening Reception at Gallery East Friday night. What a treat to see everyone. 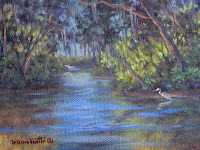 Guest Artist Pat Rausch has an outstanding exhibit of Florida landscapes and Featured Member Artist Kathy Paskey is equally impressive. Gallery East moved from North East Ocala (as the name implies) to south 441/27 in Bellview. They have a beautiful space for the gallery and ample parking. To move was a tough decision for the co-op members to make, but it has worked out well. If you are in the area be sure to stop in. You will see a collection of art work from hand made jewelry and alabaster sculpture to oil, water color and acrylic paintings. 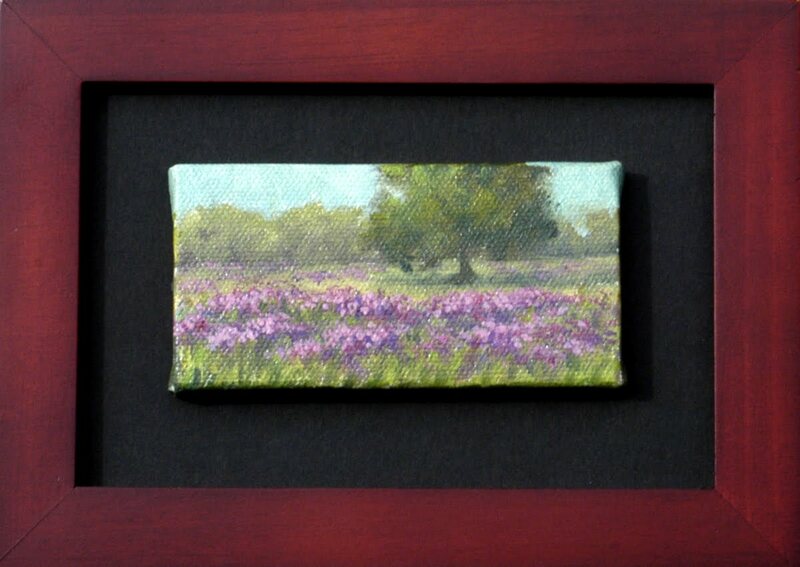 This miniature painting is a bit unusual in the way it is framed. 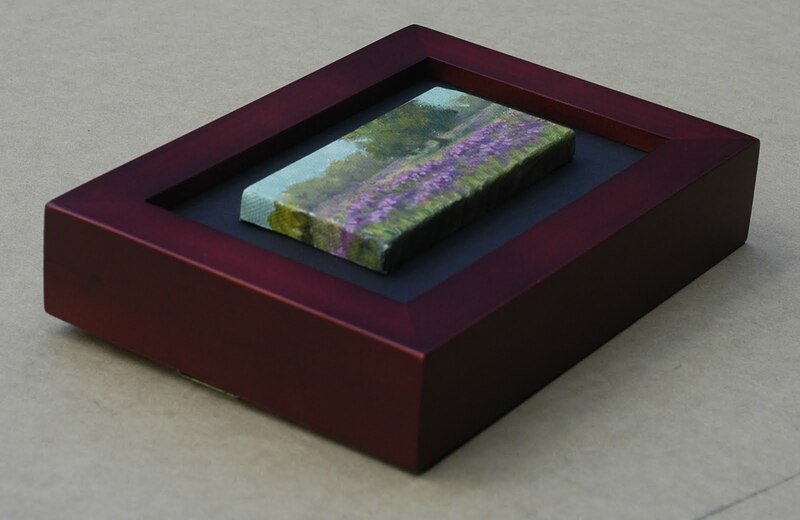 The frame profile is about 1" deep with the painting mounted on board giving it a floating effect. 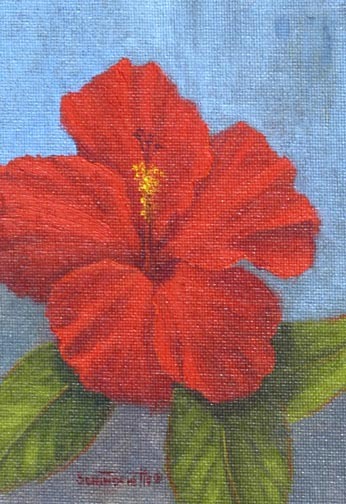 The painting itself is painted in oil on a 2" x 4" gallery wrapped canvas. The painting was inspired by photos I took during the Evinston Paint Out. Wild flowers in a field are hard to resist. You are bidding on the painting with the frame. Have fun with the auction. Be sure to get your bids in before 5 pm EST Monday August 16. Tomorrow is the first class of my 2nd class series. I am really pumped about working with this group of painters. They are at various stages of developing skill which usually proves beneficial to all the students. Novice painters learn new things while more skilled painters get "reminded" about things they know but have not thought about in a while, in addition to learning more advance skills. Several students from the first series are returning so there were only a couple of spaces for new students. The class filled quickly as a result. The next series will be September 2, 9, 16, 23. If anyone wants to join the September series, please get in touch with me. painted in oil on Canvas mounted on board. The hibiscus is a sub tropical plant found in temperate climates throughout the world. They are abundant in the state of Florida particularly in mid and south Florida. The flowers are large and showy with a variety of colors. I painted this flower from some I picked in my yard. I especially like the red ones which really "jump" out at you as they are nestled among the dark green leaves of the bush. Of course, you all know that red and green are complimentary colors which causes each to be more vibrant when placed together. Bids start at 99 cents with shipping and packaging FREE to the winning bidder. Bids may be offered until 5 pm EST. Monday August 9.